While the New York Sun's editorial writer Francis Pharcellus Church might have had his reasons to pen his famous response to 8 yr-old Virginia O'Hanlon pertaining to the existence of Santa Claus in 1897 -- it's been announced with some certainty this holiday season that there's no such thing as an Easter Bunny! Sorry Virginia, we understand your need to hang on to your fantasies, but while it's taken mankind up till 2014 AD to figure it - we are now being told that science has proven that rabbits don't lay eggs. At least that's what editorial writer Steve Dale would like you to understand. Today, in his column entitled, "Rabbits and Easter - the Truth Doesn't Favor Rabbits," he states unequivocally that "rabbits have nothing to do with Easter." And yes, Virginia, he backs up this theory with up scientific evidence: "Show me a rabbit, just one, that lays eggs, and I'll show you a a pig that can fly. Of course, rabbits are mammals and don't lay eggs." He further delineates how the Easter Bunny (versus, say an Easter Chicken] came to be and was titled the holiday animal du jour. Apparently in the 13th Century, pre-Christian Germans still worshipped the Teutonic deity Eostra who was the Goddess of Spring and Fertility. 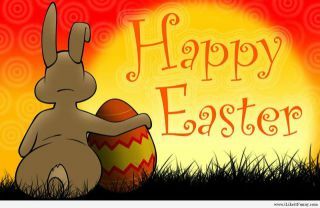 In honor of the Vernal Equinox which coincided with the Christian's Easter holiday, her symbol was the rabbit because of the animal's high reproduction rate. Yes, Virginia, while we don't know if you've been told about the birds and bees just yet, but what Mr. Dale is inferring --that not only does our Easter Bunny not lay eggs -- he's also a bit of a promiscuous rake [perhaps, you should ask your parents about that one]. 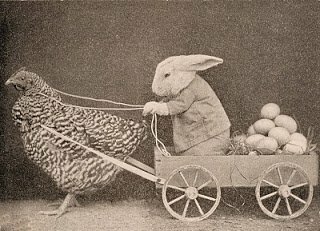 The first 'mythical' Easter Bunny to lay some eggs and hide them in a garden, according to Dale occurred in 1680 and by the 1700s, when the German immigrants immigrated to Pennsylvania Dutch country in the U.S., the tradition of making nests for the rabbit to lay its eggs was followed up by swapping out the eggs for chocolate candy treats. Dale's editorial does however point to one very concerning conservation issue -- that's resulted from all this alleged and misguided rabbit lore. "According to various sources, most rabbits (for years now) purchased around Easter are relinquished by the summer. Back in the day, these domestic rabbits were let loose outdoors to fend for themselves, and invariably subject to a death sentence," says Dale. Fortunately, he says, while this mistreatment still occurs, "there are now rescues and shelters," that help minimize this mistreatment. So Virginia, we are sorry to break Mr. Dales' news to you, but you may no longer ask the proverbial question: "what came first, the rabbit or the egg?" Unless you hearken all they way back to 1897 and Mr. Church's advice that "the most real things in the world are those that neither children nor men can see. . . nobody can conceive or imagine all the wonders there are unseen and unseeable in the world" -- and a bunny laying eggs [out of sight] might just be one of them! So Virginia, our advice to you is to hold on to your beliefs as long as you possibly can, because thank our lucky stars, the Easter Bunny like Santa Claus "will live forever."